"No one is a martyr for a conclusion, no one is a martyr for an opinion; it is faith that makes martyrs" . As a young priest he revived a parish in a "bad" district by the simple method of showing great devotion to the sick. Wanting to be a missionary, he joined the Society of Mary (Marists) at 28. Obediently, he taught in the seminary for five years. Then, as superior of seven Marists, he traveled to Western Oceania where he was entrusted with an apostolic vicariate (term for a region that may later become a diocese). The bishop accompanying the missionaries left Peter and a brother on Futuna Island in the New Hebrides, promising to return in six months. He was gone five years. Meanwhile, Pedro struggled with this new language and mastered it, making the difficult adjustment to life with whalers, traders and warring natives. Despite little apparent success and severe want, he maintained a serene and gentle spirit and endless patience and courage. A few natives had been baptized, a few more were being instructed. When the chieftain's son asked to be baptized, persecution by the chieftain reached a climax. Father Chanel was clubbed to death, his body cut to pieces. Within two years after his death, the whole island became Catholic and has remained so. 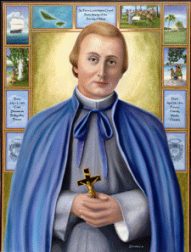 Peter Chanel is the first martyr of Oceania and its patron.